Now that Brussels is a metonym for the European bureaucracy, the Belgian capital is in danger of having its fashionable side overlooked. Then again, maybe that’s not such a bad thing, if it means a place like the Zoom Hotel can fly a little bit under the radar. 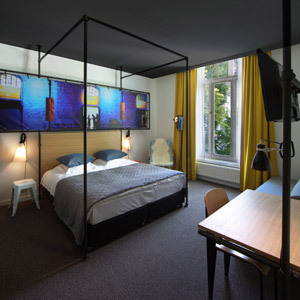 This, in its tidy, buttoned-up sort of way, is among the most stylish hotels we’ve seen lately, a minimalist industrial-chic boutique whose rooms are decorated with cinema lights, smart monochrome tiled bathrooms, and a crowdsourced photography project that fills the hotel with an ever-changing series of artistic views of the Brussels streetscape. Style aside, the Zoom has much to recommend it. The rooms are comfortable and efficient, if not exactly designed for maximum luxury. You’re just off the Avenue Louise, home to some of the city’s best shopping, as well as any number of restaurants and nightspots. The Zoom itself, like many European four-star hotels, is missing a restaurant of its own — but for a certain type of Belgophile, the gap is more than adequately filled by the Zoom Beer House, which serves hundreds of local brews alongside a selection of Belgian chocolates.